Throughout Africa, children are detained in circumstances that do not comply with international standards. Vulnerable children are particularly likely to be arrested and detained for a wide array of petty or status offences such as vagrancy, petty theft or use of abusive language. Often they are detained under the age of criminal responsibility, and alongside adults in police custody and in prisons. Many have no access to legal representation and are denied visits from parents or relatives. In Tanzania, research in 2011 found approximately 1,400 children held in adult prisons in pre- and post-trial detention. 31% of the children interviewed reported being badly treated or subjected to violence by the police, with some alleging that violence and torture was used to extract confessions. They also reported very poor conditions in police stations, including overcrowded and unsanitary cells, lack of ventilation, no bedding or mosquito nets. In Uganda, the Uganda Human Rights Commission (UHRC) reported that children were detained with adults, most often at police stations. 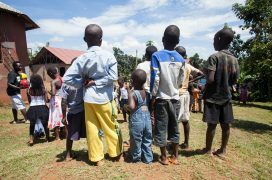 While the age of criminal responsibility in Uganda is 12, only 4% of children have birth certificates. As methods of age determination are at times arbitrary and inaccurate, children under 12 have been known to be detained. Diversionary measures for children are in place in theory, but the only schemes that are actually operating are run mainly by civil society organisations. Many children in Africa are also affected by their parent’s imprisonment. While reliable data is lacking, many thousands of children are estimated to live with their mothers in prison and many others are separated and often forced to fend for themselves. the protection and promotion of the needs and rights of children with parents in prison. supporting civil society in the region to promote juvenile justice reform and restorative justice for children, for example through joint advocacy, training and sharing good practice, including through a regular e-newsletter. See a case study on the achievements of PRI’s partnership with FHRI, Uganda. promoting the implementation of the African Charter on the Rights and Welfare of the Child (ACRWC) and the Bangkok Rules relating to the rights of children of incarcerated parents. This includes supporting the African Committee of Experts on the Rights and Welfare of the Child (ACERWC) to develop and promote the first General Comment on the African Charter (Article 30 on children of incarcerated children) and publishing the first study in Africa examining the implementation of Article 30 at a country level.